From what I've been reading on the web using google translate and from Mydramalist, CFY has taken a leave from school for EN. He has been studying on the set too. After shooting, he had been waiting for Season 2, but when the schedule finally came out, he knew that he couldnt make it because it gonna took 6 months , while he had to go back to school and prepared for university. So he took another drama instead, which schedule matched his. I heard that the shooting for that one will finish on December. Please cmiiw. Yes, I think we dont know exactly what is behind the scene. So better to think positive about both parties, I think? Just found new clips from ep 35&36, NQ finally met Book Addict MSS. Do you happen to know what wuxia drama that CFY shoot currently? 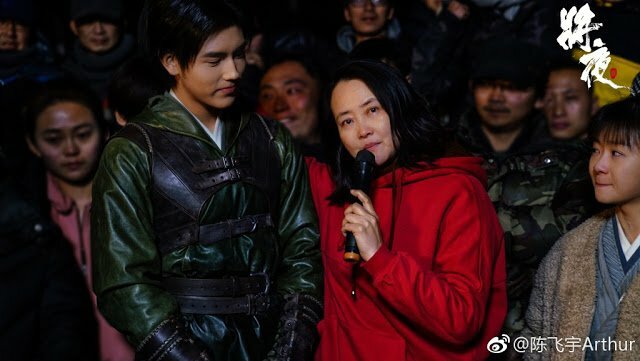 I hope it will another great wuxia drama, with great screenplay and natural fighting scene just like 将夜. Since he chose it over 将夜S2, and unmatching schedule. I will too enjoy this novel and season 1 将夜 and his next drama. Ups should we discuss this in CFY thread, sorry everybody . @pangja can I use your poster NangSang, to be my profile pic? Thank u. It's from a novel of King's Avatar author, but I heard that it's not a hit novel. I personally wont expect this to be as awesome as EN. I heard that he didnt want to be idle while waiting to return back to school, so he took this. Ever Night is a collective work by everyone involved, the directors, actors, and all the crew, so if I want to be fair, everyone is important and contributed to the shows success. But with time, I really like CFY's interpretation as NQ. He plays NQ really well, so while there is still room for improvement, I am satisfied and happy with this NQ. He is so endearing to watch. As far as i know of, Ever Night did very well, it even won an award few days ago. So news of CFY not playing NQ again definitely is something that is a surprise for me. Regardless about what really happen, I guess the only thing I can do right now is focus on Ever Night Season 1. Overall this is still a good production, and I'm looking forward to watch this Season to the end. This is a picture of the last shooting of EN Season 1. I'm sure that the second season will still have a good production value.. but I don't think I can watch another Ning Que and Sang Sang. So I might not watch Season 2. All I can say is best of luck to everyone involved. Episode 28 really gives me the vibes of Games of Thrones! You guys will get it when you watch the scene. The common quote they used in Ever Night "永夜将近" = GOT "Winter is coming"
I thought it was yours too. Wasn't it the same one that posted on NingSang forum? Yes I translated the clip on nov 21.... just a diff clip not this long one a lil shorter without all the add on scenes from their filming and all those are translated by me unless this uploader is @pangia ? No worries guys . silverpaj5 is pangia. I’ve known her work since AOL. @angelangie again, thanks for translating it. Hehehehhe..... its so adorable! I love the fact that hes still focusing on school and uni even though he could basically skip that . Ill watch season 2 as long as they get good replacement actors and the quality holds up we will have to wait and see. NQ: Sang Sang, I got to go on a long distance trip. NQ: Further than Wei city. NQ: I can't tell you. SS: It must be the Old Book Academy sending you to carry out an important mission. Or maybe it's the Tang Emperor who wants you to carry out a secret operation. NQ: How did you know? SS: Then we got to bring some thick clothes. NQ: How do you know that I will go to an extremely cold place. SS: We also got to take the preserved meat I made today. NQ: How did you know that as well? NQ: Sang Sang, this time I'm the only one going. SS: Young master, you usually take me with you when you go out. NQ: Sang Sang, I don't want to either, but the Old Brush house is our home when I'm not here, you need to watch the house. OK, quickly cook some food, young master is dying of hunger. SS: Young master, the Princess sent an invitation for us to go to the palace to have dinner. This time you must go. NQ: Looks like she also knows. Blindfolded Sang Sang plays hide and seek. SS: Little Man, you must have hidden. Little Man. Princes: What are you guys doing here, NQ. NQ: We are hugging, long time no see. Third Prince: Princess sister, he's bullying me. NQ: This sort of thing will not happen a second time, best that it does not happen again. Goodbye. Little Man: Mother, just now I saw Uncle trying to kiss Sang Sang. NQ: She's unlucky to have such a brother. NQ: So what if he's a prince, he's just a good-for-nothing loser. NQ was like a husband asking permission to leave from his wife. And I also love this part. I feel bittersweet because I support his decision to go back to school, but I really want to see him in Season 2 . I really hope that he can make it at least in Season 3. I wanted to accept that he is going to be only in S1, but after I watched the newest episodes last night, it's really hard . He is really likeable as NQ. It's like Daniel Radcliff as Harry Potter and Emma Watson as Hermione.